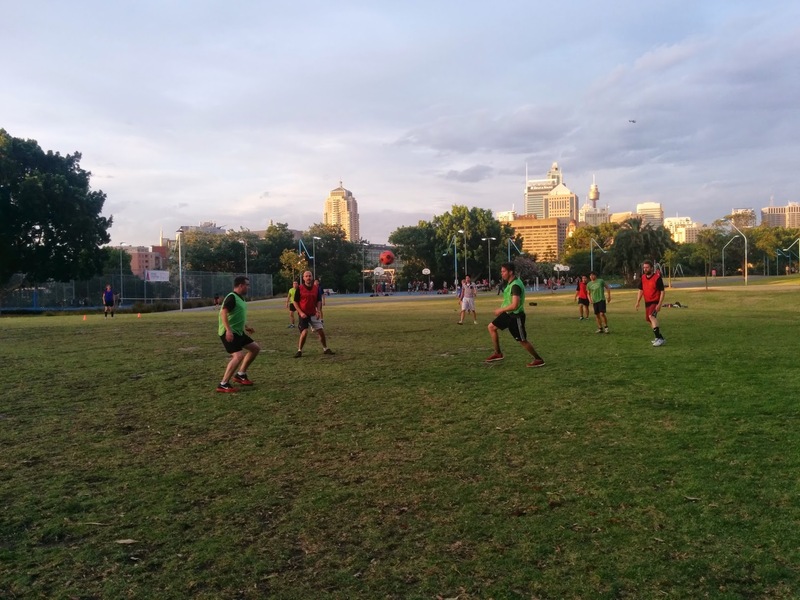 After the launch of regular 3-sided football matches in Melbourne this year, a core group of Sydney friends and colleagues were eager to try out the game as a one off bit of fun. Andrew F, one of the original players of Melbourne’s inaugural match and referee for much of the winter season due to injury was prepared to travel and help organise it and so a plan came together. It took a while to organise schedules and get enough people interested, but finally the match was scheduled for November 20 after work in a park in Sydney’s CBD. Sydney switched on a fabulous late spring evening – Temperatures in the high 20s and a stiff evening sea breeze bringing with it a tang of salt on the air. The pitch was set up in Prince Alfred Park – a location that was central, though had some challenges constructing a pitch between significant holes dug by dogs looking for bones. Eventually a site was chosen though it was characterised as being half dirt, half grass and had a significant slope on one of the goal lines. The game must go on however! At 6pm, players arrived and after a few no-shows we pulled together just enough for a game. Sax Cucvara, the organiser of the match, devised a method of allocating teams that involved the order of rolling 2 20 sided dice. No one was really sure of huge method but it seemed to work and teams were allocated, but the the green team at disadvantage being a player short. Green were given the kick off and choice of starting goal to compensate. A quick briefing by Andrew on the overall rules and some points of strategy that had been found during the Melbourne matches and the players were ready to go. Unfortunately pithy names weren’t forthcoming so teams were simply red, blue and green – the colours of huge bibs each team were wearing. Play commenced and an extremely rapid attack was mounted on the green team by a pair of players from Blue. Danielle scored the first goal of the first Sydney match within a minute of kick off, displaying wonderful soccer skills, catching the green players off guard and being wonderfully assisted by Bernadette. The bar was officially set and play resumed, green eager to gain reprisal for the early concession. Some quick affiliation by the greens with the reds (who clearly felt obliged to make up for the numbers disadvantage) saw a sustained attack on the blue goal, with a strike eventually making it through. After the initial flurry of attack and counter attack, the third settled, with only one more goal being conceded, this time by the green team against the reds. Scores were equal with 1 apiece at the first break. During the break, some discussion was had around switching players in order to shift the player disadvantage around. During this time, one of huge players, Ringo entreated a couple of guys having a kick about nearby to come and play with us. A super quick brief and they were seconded to the green team (they also happened to be wearing green tops). The effect was immediate with green dominating the play of the second third, scoring against red and blue twice each. Blue struggled to find the goal, though not for lack of trying with numerous attempts on the green goal by Danielle, Bernadette, Ringo and Andrew but none finding their mark. Red finally broke the green defence, scoring their second goal of the match. Minutes out from the end of the third we were approached by a chap who had been sitting and watching the game unfold. Lion was from China on holiday and wanted to play too. He was quickly attached to the blue team (he had a blue top on) with the instructions to just help defend the goal which he did admirably. As the sun set, the final third commenced. Green were dominating, with a seemingly impenetrable defence and one goal ahead. Play shifted back and forward with red and blue showing moments of collusion before trust broke down due to opportunistic attempts on each other’s goals. Lion, our Chinese ring-in player proved a competent player even in plimsolls and holding an iPhone in one hand whilst playing. As legs tired, the green defence held strong with neither red or blue able to crack it. The third ended with not a single goal conceded by any team and green as the winners. After a commanding second third and then holding up their defence in the final, the green team emerged the winners through only conceding two goals, to red and blue’s three each. As the sun went down, many remarked at how much fun they had and when the next match could be held. Everyone was covered in the dirt that arises from playing football in a dust bowl but cheerfully went to the pub for a couple of beers to relieve glories or lament missed opportunities. The game was a lot of fun and it is great to see interest in the game outside of Melbourne. With noises of more regular matches being played, here’s hoping we can see an interstate match occurring some time in 2015. 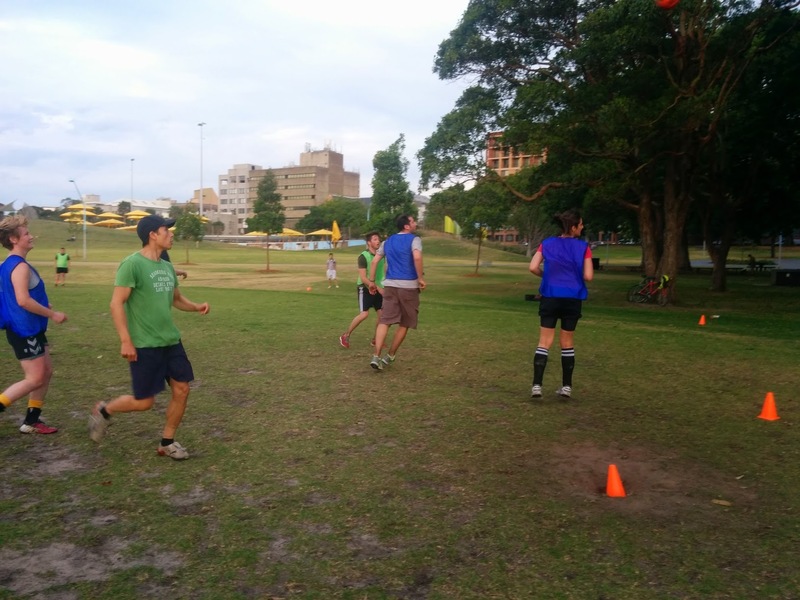 A huge thanks to everyone who came along to the first ever Sydney 3-sided football match and a special thanks to Sax Cucvara who herded cats to make it happen. This entry was posted in Match Report and tagged 3 sided football, australia, football, geometry, goals, hexagon, soccer, sport, sydney, three sided football on December 4, 2014 by dickmcarthur. This seems very interesting. 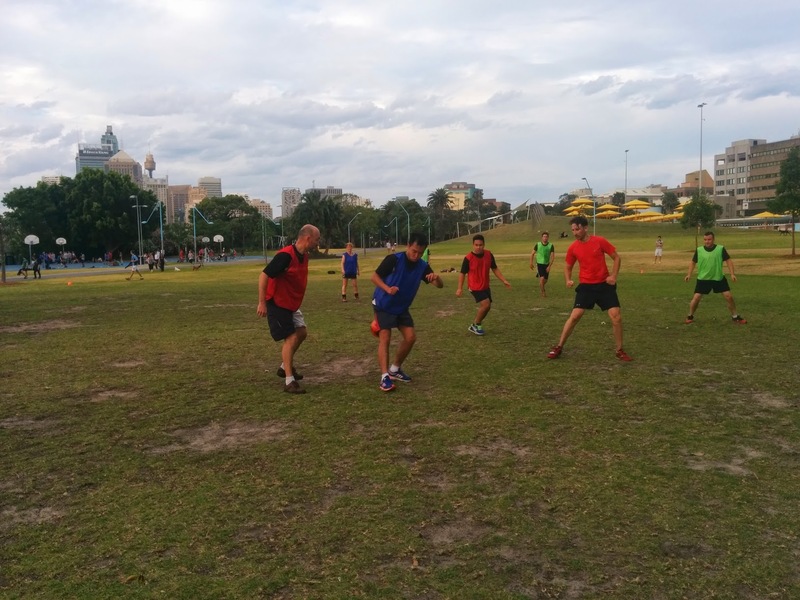 I’m based in Sydney and play football every couple of weeks with people from work, I think I could rustle up some interest for a game of 3-way football if anymore games are on the cards. Please let me know if so (or who to contact if I’m asking in the wrong place!). is the next step to add another pitch on top with ramps like a multistory carpark? Hey Nils, really sorry I missed your comment from several weeks ago. One of our members in Melbourne has plans to run future games in Sydney – if you want to keep an eye on this blog site I’ll notify you of any planned games.